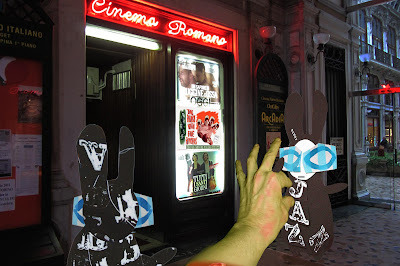 The Wabbit suddenly turned and the severed hand jumped back. Wabsworth tentatively touched flesh that felt clammy and yielding. The Wabbit sneered and shouted, "What do you want?" For a moment the hand hung like a flap. Then fingers traced the outline of a piano and pecked at the Wabbit's fur. Music filled the arcade with wrong notes that growled and howled. Everything was off key. The hand jarred and twitched and the five fingers pinched. The Wabbit bared 28 teeth and snapped viciously. The hand retreated and bumped into Wabsworth with its stump. Wabsworth brushed it off and spoke up. "Perhaps you'd like a nice ring? I can get you five if you like." A forefinger wagged negatively and made another shape. "It wants a piano," said the Wabbit and he mimed playing one with his paws. "Skratch the Cat can get a piano," said Wabsworth quickly, "he can get anything." "He can get you sheet music, too," said the Wabbit. "And a stool," added Wabsworth, immediately regretting it. Nonetheless, the hand seemed enthusiastic because his fingers were all of a flutter. The Wabbit hummed the Last Concerto but now the hand was far from pleased. It wagged a forefinger at the Wabbit and made a move for his ears. Wabsworth grabbed the arm and twisted, the Wabbit forced the thumb backwards - and together they wrestled the hand down. "It's time to face the music," smiled the Wabbit.